Weddings in Positano. Also called Pearl of the Amalfi Coast, Positano is a perfect scenery for a wedding in Italy. Positano is built into a cliff with a winding one-way avenue down from the top to the beach at the bottom before winding back up with all the accommodation near by built into the same cliff. It's quite a walk from top to bottom but there are buses all day that make it easy. Civil Weddings in Positano can be performed in the town hall, which has a wonderful terrace overlooking the sea with a breath-take view. 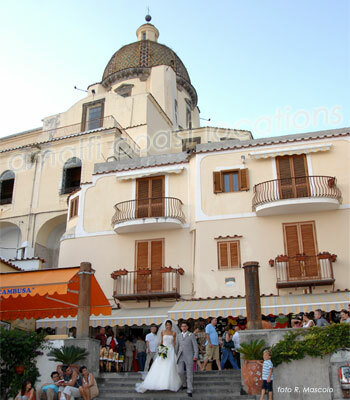 You can have a Religious marriage, getting married in Positano's main Church, just a few meters from the beach.